Around 1.200 Universities in 86 countries from all around the world were analyzed in the World University Ranking 2019, Times Higher Education 2019 and UDD stood out among Chilean Universities, ranked as one of the best in the country. 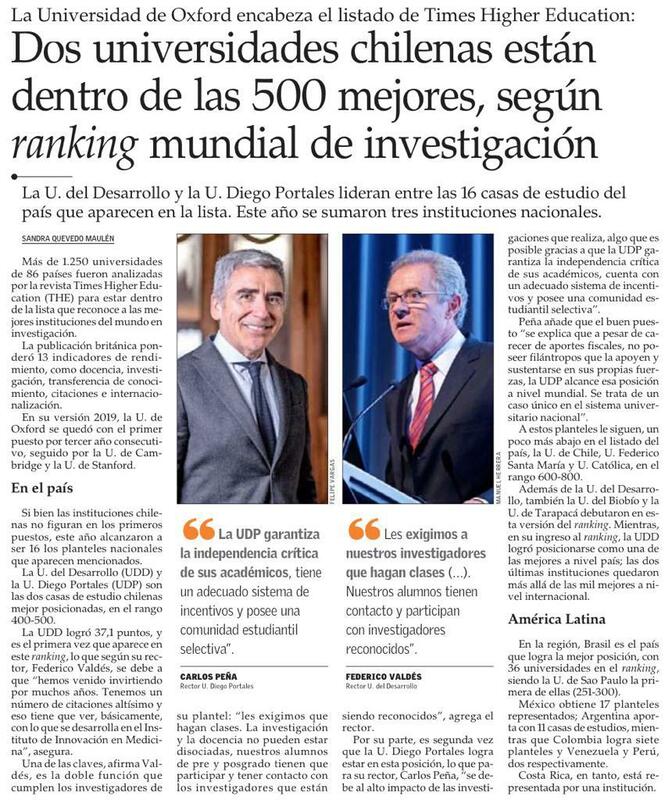 UDD obtained 37,1 points and it is the first time it was featured in this ranking, as stated by UDD´s President, Mr. Federico Valdes that this is mainly because “we have been investing for many years. We have a very high number of quotations, and this has to do mainly with what is being developed in the Medical Innovation Institute”. The classifications were based on a calibrated score of 13 indicators and the purpose of the study was to determine the most research intensive universities, for which the study concentrated on four items: teaching, research, knowledge transfer and international outlook. Oxford University occupies the first place for the third time in a row, since 2017. Cambridge and Stanford occupy the second and third place respectively. Brazil obtained the highest regional presence with 36 universities, compared to 32 of the previous ranking. The first one is the University of Sao Paulo, which maintains its position in the ranking between 251-300. Colombia has seven universities in the ranking, while Peru and Venezuela have two. Costa Rica is represented by one institution. Read the article published in El Mercurio here and the complete analysis of the THE ranking here.